JNN 05 Mar 2015 Sanaa : Two suicide bombers killed at least two Houthi fighters in central Yemen on Tuesday, security sources said, highlighting the foreign Interference in the internal Matters of the country , as Saudi and US Backed Al Qaeda intensifies its activities , to sabotage the General Public’s Over throw of Incompetent , Corrupt Govt of President Hadi . 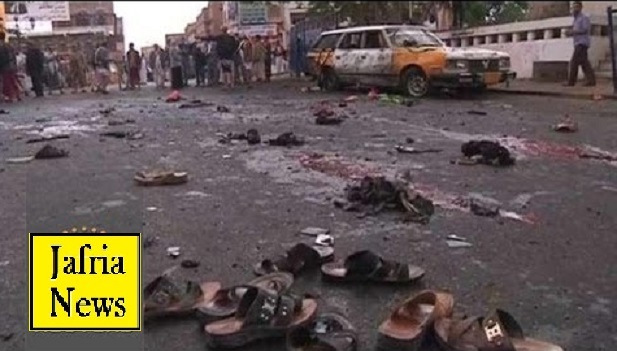 No one immediately claimed responsibility for the attack but it resembled bombings conducted by Wahabi Al Qaeda in the Arabian Peninsula (AQAP), one of the most terror groups that has been battling the Shiite Houthis since they captured its central Yemen strongholds last year. The sources said at least 15 other members of the group, officially known as Ansarullah, were wounded in the attack on a youth center turned into a militia outpost in the city of al-Baydah in central Yemen. They said one of the two suicide bombers was shot dead by the Houthis when he opened the gate of the youth center for the second bomber, who drove his vehicle inside the compound killing two militiamen and wounding 15 other people. Violence has spread and intensified in Yemen since the Shia Houthis captured the capital Sanaa on Sept. 21 and fanned out south and east . Yemen plunged deeper into political turmoil in January after the Houthis seized the presidential palace , due to which the Western-backed President Abd-Rabbu Mansour Hadi and the sitting Cabinet was left with No Option , but to Resign from the Govt. Political factions have been in talks to try to find a way out of the crisis. The talks were complicated after Hadi fled the house arrest imposed on him by the Houthis in Sanaa and moved to the southern city of Aden, which is outside the group’s control, where he reclaimed the presidency. Once an obscure religious movement in Yemen’s north seeking greater autonomy, the Houthis have established themselves as power-brokers and have sent their militiamen into the west and center of the country, far beyond their traditional redoubts. The United States and its Gulf allies fear the loss of complete Power from the country , for which they are trying to spread sectarian violence in Yemen – situated between Saudi Arabia and an important shipping route on the Red Sea – will unravel the government’s already limited control over its territory. In a separate attack, three government soldiers were killed and two were wounded on Tuesday when a bomb tore through their patrol in al-Qatan city in the eastern Hadramout province, another area where AQAP operates, local media reported citing provincial officials. The leader of the Ansarullah (Houthi) movement, in an unusually combative speech on Thursday, accused Saudi Arabia, Yemen’s powerful neighbor, of financing armed opponents and trying to divide the country. The Ansarullah movement controls the capital, Sana’a, in northern Yemen, and much of the nation’s military. Yet their authority faces a sharp challenge from Yemen’s former President, Abdu Rabbu Mansour Hadi, who fled to the southern city of Aden on Saturday and, with the backing of Saudi Arabia and other Persian Gulf monarchies, declared that he was still the country’s legitimate leader. Yemen has been without a government since late January, when Hadi and his cabinet resigned under pressure from the Ansarullah movement. Now the country appears more and more splintered between competing fiefs in the north and south, raising fears that it will suffer the same fate as Libya, riven by increasingly bloody factional fighting between rival governments. There are also concerns that the power vacuum will benefit al-Qaeda’s powerful local affiliate, which has been adept at seizing on political chaos in the capital to capture territory. As the conflict in Yemen has accelerated, nearly all Western and regional countries, including the United States and Saudi Arabia, have shut down their embassies in the capital, adding to the international pressure on the Ansarullah to reconcile with their enemies. Like in Libya, regional powers have been accused of playing a provocative role in Yemen’s latest feuds, by supporting opposing armed factions. In his speech on Thursday, the Ansarullah leader, Abdel Malik al-Houthi, abandoned earlier conciliatory language and reacted angrily to reports that the Saudis, as well as Qatar, had sent their ambassadors to Aden in a show of support for Hadi. Houthi complained about the expulsion of Yemeni workers from Saudi Arabia and accused its monarchy of trying to “exploit” Hadi’s move to Aden while attempting to “to introduce the Libyan model and impose it on Yemen.” He also asserted that the Saudis were supporting anti-Houthi tribes in Marib (Ma’rib), a province (Governorate) east of the capital. The current crisis began in September, when the Ansarullah moved from their base in the northern Saada (?a’da) region and seized the capital, declaring that Hadi’s government was both ineffective and corrupt. The Ansarullah movement quickly advanced beyond Sana’a, sparking a violent reaction from the al-Qaeda in the Arabian Peninsula (AQAP), their longtime foes. Since then, Yemenis and foreign diplomats have watched with alarm as al-Qaeda has steadily gained allies among tribes that oppose the Ansarullah (Houthis). In January, the Ansarullah movement put Hadi under house arrest, forcing his resignation and toppling the government. Hadi remained under Ansarullah guard until last week, when, in a confusing turn of events, he was either released or escaped. Hadi quickly made his way to Aden, a dilapidated port city and a stronghold for Yemen’s southern separatist movement, as well as an area where the Ansarullah have faced resentment and have virtually no control. This entry was posted in Middle East and tagged Al-Qaeda, Militia Men, Shia Houthis, Yemen. Bookmark the permalink.